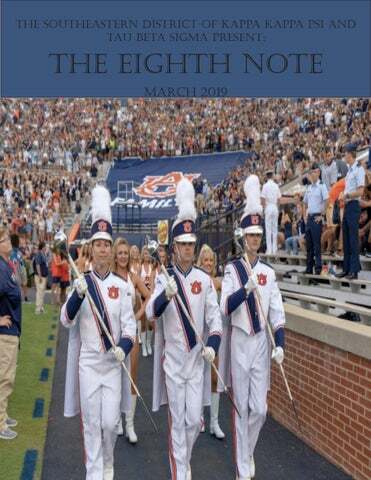 About the Cover Brothers Sarah Niedzwiecki, Aaron Thompson, and Trey Bruce are drum majors for the Auburn University Marching Band. Exhibiting the highest level of leadership the band has, these brothers truly exemplify striving for the highest. The Auburn University Marching Band maxes out at 380 members, including winds, percussion, and auxiliary. The Pi Chapter of Kappa Kappa Psi has membership in each of these sections, frequently serving as section leaders. Aaron Thompson, center, served as head drum major for the 2018-2019 season. Sarah Niedzwiecki, left, will serve as head drum major for the 2019-2020 season. Trey Bruce, right, will also be returning as a drum major for the 2019-2020 season. Interview with Austin Myers Kappa Kappa Psi, Zeta Chi University of South Carolina 1) What is your name/major/instrument/year/initiation? My name is Austin Myers. I currently serve as the president of the Zeta Chi Chapter at the University of South Carolina. I am a junior history major with a minor in music. I play the trombone in concert and marching bands, but I play drum set for the basketball band. I plan to graduate in May 2020. I was initiated into our great fraternity in Spring 2017.
tional brothers, 26 brothers are in either music education, performance, or theory, while the other 21 have majors outside of music. Those being history, economics, psychology, sociology, and biomedical engineering. 4) How does your chapter bond both and with its sister chapter? First, Zeta Chi and Epsilon Alpha have a great bond and work together very well at the University of South Carolina. A cou2) Why did you join KKPsi? ple of semesters ago, we adopted a set of joint procedures that require us to hold I joined KKPsi because I had a strong at least one joint chapter meeting with love for the USC Band Program and our sister chapter but aside from things band in general. When I got to USC, that bind us by rule. We try to do a great I wanted to find an organization that deal of joint service projects and socials. would help me serve something bigger As stated in a later question, we try to than myself. What better way to serve have a joint recruitment event with the then my serving a program that has giv- sisters every semester. Also, our chapters en so much to me? assign cross big brothers and sisters for the membership candidates. Once they 3) What makes your chapter unique? are assigned, the bigs send anonymous letters to their little until they either figZeta Chi is unique in that we are a diure out who they are or until our Brothverse group of people from different erhood-Sisterhood Ceremony. I had the majors and walks of life who come topleasure of leading the revision to that gether for the sole reason of our love of ceremony that allowed for the littles to music. Among our 47 active and condi- know who their big was all at one time. To further solidify that bond in that ceremony, I wrote an oath called The Oath of the Big Sibling, which reaffirms the bond we share in both our music and service to those who are joining our great organizations. Recruitment was a four-day event that included an informal informational, joint-music night with Tau Beta Sigma, a service night, and, lastly, a formal potluck to end the week. At the potluck, we got to ask the potential new members questions on different topics related to 5) How does your chapter select candi- becoming a brother, what they believe dates? Describe your recruitment. they get out of their membership process, and why they wanted to even be in In Zeta Chi, like most, we have a recruit- Kappa Kappa Psi. We then convened a ment week where we get to meet and special meeting to vote on prospective interact with those who have an interest membership bids. 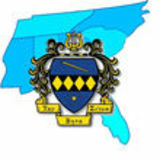 Even before recruitin Kappa Kappa Psi at the University of ment week, our brothers were actively South Carolina. For Spring 2019, we had seeking out outstanding bandmembers a Marvel/Avengers themed recruitment. who exhibit our values and ideals. 7) Anything else? Zeta Chi is excited to receive the Chapter Leadership Award, be in the running for the William A. Scroggs Founders Trophy, and to give our presentation at National Convention in Stillwater this summer. Interview with Alec Anderson Candiate, Kappa Kappa Psi, Pi Auburn University This interview was conducted at District Leadership Conference 2019 What was your favorite workshop? The Robert’s Rules workshop! I’ve been using it for a while, but I’m always still learning. It’s cool to see how efficient it is, but also to see its quirks. What was your favorite part of today? Getting to see people from other chapters If the district had another service project, what would you suggest? Having a coat donation since DLC is around the end of winter here in the South. What’s a major takeaway you had from today? Brotherhood is really important. It doesn’t just end when you finish being an MC, you’re constantly learning and growing with the people around you. If you could teach a workshop at DLC, what would it be about? Fun things to do and how to go about connecting with other chapters. Some chapters are so close geographically, but never actually hang out. 1) What is your name/major/instrument/year/initiation? 6) Anything else? My name is Henry Panion IV. I am a music major at the University of Alabama at Birmingham. My primary instrument is trombone. I was initiated into the Kappa class of the Theta Theta chapter in Fall 2010. 2) Why did you join KKPsi? Music and band have shaped my life since I was a small child. I have always loved serving my music and band communities, and Kappa Kappa Psi gave me a great opportunity to continue sharing my love of music and band. 4) What experiences have you had outside of your chapter that have made an impact on you as a brother? While this is not an experience from “outside the chapter,” I like doing outreach projects with school bands in the area. It’s always enjoyable to provide support and encouragement to kids that might not get enough on a regular basis. It’s a pleasure to see the excitement on kids’ faces when brothers show up to share their love of music, whether it be helping out at band camp, teaching lessons, or playing along with them at sporting events. 5) How has your chapter evolved? The Theta Theta chapter became coed a few years ago, which was a major step for the chapter. Overall, it is great to see the chapter continue to grow and evolve into an even more cohesive family. Always remember why we are here. Never let anything get in the way of our purposes. This interview was conducted at District Leadership Conference 2019 What was your favorite workshop? Actually, it was the keynote speaker! The five points he mentioned are important and impactful. You need a purpose and a vision in order to accomplish any kind of goal. Beyond that, I really enjoyed the Robert’s Rules workshop. A lot of our brothers are graduating, so there’s a lot more I need to learn. What was your favorite part of today? The moments between workshops where you could introduce yourself and have discussions with other chapters! If you could give a workshop at DLC, what would it be about? Breaking traditions. At some point, you have to question why we do the things that we do. Are they meaningful, or do we just do them because we’ve always done them? If the district had another service project, what would you suggest? Having a food drive. There’s a huge amount of food disparity, even on college campuses. Tau Beta Sigma, Theta Zeta and Kappa Kappa Psi, Iota Zeta North Carolina A&T State University This interview was conducted at District Leadership Conference 2019 with Alexis AE: It’s so cool to interact with people from all Sides, AnJane Claytor, Aaron Evans, Adjoray over with a common goal! Yed, and Quenci Bradley Favorite workshops: AS: Project Your Voice - I want to bring the idea of confidence and public speaking back to my chapter and candidates! It’s an important aspect of your entire life, not just when you’re in college. If the district had another service project, what could it be? AE: School supplies is definitely a handy project. But also, finding students who are passionate about band and getting our organizations’ names out there would help promote us and band! AY: SMART Goals - I liked the idea of being able to create a plan for your dreams and also AS: Recruitment for college bands manage being realistic. AC: A database of schools and their academic AE: What’s your Style - It’s nice to know and band requirements. Encourage chapters there’s a lot of people like you! It’s also cool to go visit its local high schools and middle to know how everyone works. That makes schools to inspire them to keep going with things work more efficiently. band. AC: Bullet Journals - Focusing on the ABC’s (academics, band, and chapter) was cool because our director makes a big deal on focusing on how to balance all of them. Knowing that it’s also a thing within the district is a neat connection to make. QB: Being a Brother is not a Part-Time Job: I liked drawing out a person who represents the fraternity and the aspects and ideals we hold dear. When you take away any single one of those aspects, it’s hard to be a quality brother. AE and AY: Maybe having a district-sponsored band clinic the first day (Friday) of SED, but make that Friday into a whole-day event and not just registration and ritual. You could expand on our music blocks and have students come in and expose them to college bands/ guard early on! That way, they also have the chance to see that you don’t have to just be a music major or be from a certain walk of life to be in band in college. Interview with Ted Panos Kappa Kappa Psi, Alpha Eta University of Florida This interview was conducted at District Leadership Conference 2019 What’s something you’ve learned from today that you want to bring back to your chapter? How to have casual social events on campus! A lot of chapters seem to do that frequently, and it’s a cool and easy way to hang out with each other without having to break the bank. What’s your favorite part of today? Meeting brothers from other chapter What was your favorite workshop? KKPsi is more of a connection with all kinds of people beyond just your chapter. What’s a fun fact about your chapter? AH is the 31st chapter and was founded in 1931! Engineering runs deep in my Kappa Kappa Psi family. My big graduated last Spring with a chemical engineering degree and is currently in medical school at the University of Alabama at Birmingham. My little is also in chemical engineering, and I am studying industrial and systems engineering. Although Kappa Kappa Psi is an honorary music fraternity, my family is not the exception in the Pi Chapter; we are the norm. Of our 60 active and conditional brothers, only 17 are music majors. The union of being a non-music major, yet remaining heavily involved in music at the college level, is one that people from the outside often do not understand. People often wonder why we participate in such a time-consuming activity when it does not necessarily “help our career.” However, I can attest to the fact that music not only doesn’t hurt my career goals, it propels me to do even better than I could without music. One way music really benefits me in the engineering world is with managing my time responsibly. I know I only have a certain amount of time to do my work because of the rehearsal schedule we have in the Fall, so I have to remain disciplined to do my work in the time I have. Another way music helps me is in teamwork and interpersonal skills. Teamwork is huge in engineering classes right now because companies are complaining that universities are producing “smart people” who cannot communicate or work with others. Spending time with and relying on the members of your section and band program on a daily basis helps me to get to know and trust people who come from diverse backgrounds. Being on the leadership team in my marching band also helps me with project management skills in engineering. With all of that being said, I do not just participate in band in college as a means of professional development. It is something I truly love, and it helps me to keep my life in balance. If I only spent my time finishing my tasks for my major courses, I would get burned out very quickly. There is only so much math I can do before my brain just shuts down. The relief of coming to the marching band practice field every day and hearing great music for two hours is such a wonderful thing. I feel as though the last six years I have spent in marching band have shaped me into a better leader, a better friend, and a better future employee. I owe marching band much of my personal success both on and off the marching field. I hope those who are future music educators will be sure to spend just as much time investing in those not looking for a career in music, and I hope to be an example as to why. Though it may not be my future, the experiences I have had and skills I have gained will last a lifetime. Interview with Finn Spencer Kappa Kappa Psi, Alpha Eta University of Florida This interview was conducted at District Leadership Conference 2019 Major takeaway from morning workshops (What’s your Style and Being a Brother is Not a Part-Time Job) You’re always reflecting the fraternity. The good things you do reflect well upon the fraternity, but the bad things also reflect upon the fraternity. If you could give a workshop at DLC, what would it be? Ritual workshop - how to find a part that fits you best, how to audition for parts, how to set up auditions for parts What’s your favorite part of district events? Meeting people! Getting to see old friends and make new ones is exciting. Everyone always has something new to bring to the table. I really enjoy bonding with my brothers! Interview with Holleyanna Nolen Tau Beta Sigma, Eta Lambda University of Alabama at Birmingham What’s something that’s unique about your chapter? Tell me about a service project? For the chapter’s crescendo projIt’s very diverse! Almost no one ect, Eta Lambda visited low-privis the same major. When it hosts ileged schools near its campus. elections, the sisters find difficulty The sisters brought instruments in selecting an officer as diverse and hosted an instrument petting as their chapter’s composition. zoo. Eta Lambda also provided musical help through advice You’re going to be hosting SED and playing alongside the stuthis year, what’s your advice to dents.”You don’t realize how future chapters interested in host- privileged you are.” ing? Holleyanna’s biggest advice to future host chapters is *communication. * What is a fun fact about you? In Holleyanna’s senior year of high school, she was at marching band rehearsal when she did the whip… and promptly sprained her left ankle because of it. and paint the 34th Street Wall (graffiti wall), and a service and fundraising project How does your chapter fundraise? We do restaurant fundraisers. We recently created a website for Gator Band merchandise, and we are trying to implement new fundraising stuff. Amber Janae Tubbs Fa ‘16, Parth Patel Sp ‘17, Emily Gunby Sp ‘18 What is a fun fact about you? One of their chapter’s Alpha line sisters is involved with a new Amber has been an officer all of Tri-M chapter, high school muher active semesters: Immediatesic honor society. KSU went and ly after completing candidacy, she taught the new chapter Robert’s was elected parliamentarian folRules and the importance of serlowed by corresponding secretary vice through music followed by (and currently is) pres- On Valentine’s Day KSU buys ident. roses and cards for its band directors How would you describe your KSU is currently working on chapter? publishing a children’s’ book to help elementary students engage “We’re just weird and funny” with music. [SPOILERS]: A -Amber snake is searching for what in“Sharp minds and sharper tongues” strument makes the same noise -Parth Patel, former VPM as its rattle. Throughout the book, different animals present What service do y’all do? themselves and say which instrument can create their noise Fords Cemetery May 8th (I need to (for example a trombone makes ask about this) an elephant noise). There’s also Elementary school and old folks a saxophone, flute, percussion home instrument day with instruinstruments, trumpet, and more. ment stations Will the rattlesnake find its identity? Read more to find out. Interview with Atia Aroonsakulwongse Kappa Kappa Psi, Theta Theta University of Alabama at Birmingham Atia Aroonsakulwongse, fresh from a last-minute SED meeting, conversed on the phone. She is the president of Theta Theta of Kappa Kappa Psi at the University of Alabama at Birmingham, where SED will be hosted later this year. Atia joined in Fall 2016 when she became involved as a freshman with nine others in her class ‒ Theta Theta’s recruitment is exclusively during Fall semester. Members may be recruited in Fall then initiated sometime during the halfway mark of the Spring semester in order to avoid midterms and finals. Approximately 10 percent of Theta Theta is comprised of music majors, with the remaining 90 percent of majors displaying diverse variety: biology, engineering, foreign languages, and more. This semester, in addition to hosting SED, Theta Theta is look for more fundraising opportunities and to do more outreach with Birmingham City Schools. Alumni brothers, who work in music programs, reach out to Theta Theta with service ideas. Recently, the chapter completed a projected with Hewitt-Trussville High School. It also organized the music library of a school. theta and Eta Lambda are currently working on a joint ritual. Atia commented the close-knit chapters “hang out pretty often… we see each other almost every day,” and they are now much closer with Eta Lambda! Jessica Haywood, Atia’s Big, inspires her. Jessica’s work as former president “completely turned this chapter around [by]… how much she loved this organization and how much work she put in” with working with officers to be more involved and set semester goals. Atia “never thought [she] would join Greek life and love it this much,” and she believes being a brother has made her more outgoing. The installation of the Epsilon Gamma Chapter (#123) at Alabama State University in Montgomery, Alabama, on January 27th. This is the second installation of the 100th year of the Fraternity and joins an ever growing Southeast District! The new chapter includes 10 members who are now Brothers of our Fraternity.